Cut and tear resistant tread compound for excellent wear in regional and light On/Off drive applications. 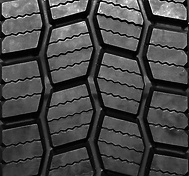 Closed shoulder 13/32” | 20/32” | 26/32” tread design provides even tread wear while still providing excellent traction. Applications: Long haul, over the highway drive position.